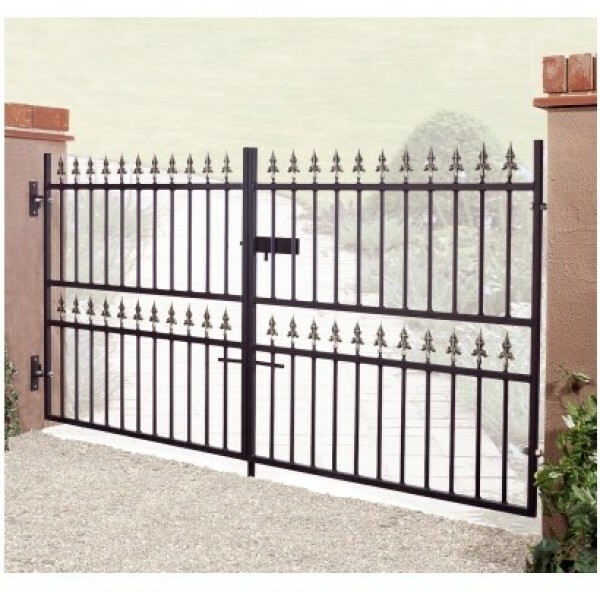 The Corfe Double Gates are made from solid steel infill bars with a chunky hollow box frame for a heavyweight wrought iron appearance. These high quality gates have a simple design with elegant fleur-de-lys finials that would compliment the grandest of buildings. Gate posts that are designed to be concreted into the ground and are supplied with the hinges pre-welded to them are available for £75 - Size 10cm (4") square. For example, if the measurement between your walls is 10ft. You should order the 10ft gate. If you also require posts, the space taken by the posts will be in additional to the gap required for the gate, so a 10ft gate and 2 x 4in posts will require a total opening of 10ft 8in. Fittings. 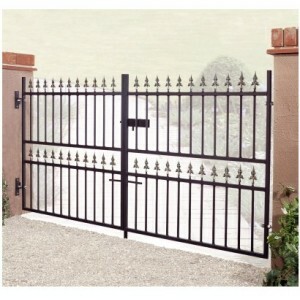 The Corfe Double Gates are supplied with hinges, latch and two drop bolts. Please note that the hinge plates require a flat vertical surface for installation. Opening Directions. The Corfe Double Gates can open in both directions. The latch is fitted to the right gate when viewed from the road. Finish. The Corfe Double Gates are supplied dipped in a black primer ready for you to paint with a top coat in the colour of your choice. We recommend Hammerite but any exterior metal paint can be applied.